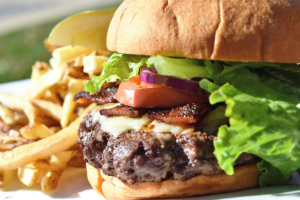 The IowaStater Restaurant is honored to be nominated in the Top 10 Burgers in Iowa 2019 for the second year in a row! Thank you to all who submitted your nominations for us. We are excited for the opportunity to compete for the title of Iowa’s Best Burger! At The IowaStater we pride ourselves on using the highest quality, locally sourced ingredients, 100% Angus Prime Beef and expertly preparing your meal as desired.